In part one of this interview with Max Trescott, 2008 National CFI of the Year, we discovered his path to the right seat as a CFI. Now, in part two, we take a deeper look inside the head of this well-known CFI, to find out what life is really like as a person who teaches others how to fly. World of Flying: What is the best and worst thing you like to teach to primary flight students? Max Trescott: The best thing I like to teach primary students is risk management concepts. About 80% of the accidents are the result of pilot error, yet the Practical Test Standard (PTS) barely addresses risk management. Most tragic are the pilots—and I can think of two in my area in just the past two years—who embark on flights at night over the mountains soon after they get their Private certificates. In both cases there were no survivors. I don’t think either pilot had any idea of the high risk that he was taking on by making those flights. It’s important that CFIs teach pilots how to evaluate their environment and make good decisions that will keep them alive. The sad fact is that many flight instructors just teach what’s required in the PTS to pass the checkride, which is the FAA’s MINIMUM standards for getting a pilot certificate. When they do, they’re doing their clients a terrible disservice. The most challenging lesson to teach is the first day of landing practice. Those are the days on which I really earn my pay, since I’m trying to let pilots make mistakes and see the results of their actions without actually bending any metal. World of Flying: Who makes the best primary flight students. Max Trescott: The best students for any certificate are those who are motivated and want to learn. Learning is an active process that requires a lot of work by the client. If a student shows up and thinks that they can just sit back while I pour knowledge into their brain, there are greatly mistaken! I’ve had very few clients who didn’t show up motivated and willing to work. And the few who weren’t didn’t hang around very long. 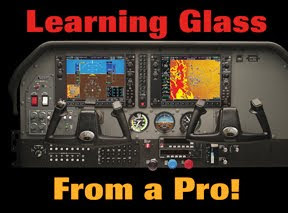 World of Flying: In teaching the G1000 panel to a previous steam gauge driver, give me some examples of things that have to be unlearned, and describe some of the obstacles you must overcome to get them to understand glass. Max Trescott: Interesting question. For all pilots, beginner or experienced, the toughest challenge is to get pilots to look outside the window! The computer displays (the PFD and MFD that sit in front of the pilot and copilot) are really attractive nuisances. Like my cat, they almost beg for attention! So it’s important to make pilots understand that they can’t spend most of their time looking at the displays. Of course that runs counter to initially teaching pilots how to use the displays. Thus, I find the most effective way to transition pilots to the G1000 or Perspective is to get them to read part of my book or CD-ROM ahead of time. Or we can sit in the G1000 simulator or even the airplane itself while it’s still on the ground to explain the fundamentals. That way, they already know where to look for airspeed and altitude and aren’t hunting to find the instruments in flight. World of Flying: Do you find a fresh zero time primary student has an easier time of learning to fly when they have all their training in a glass cockpit environment? Max Trescott: I think the G1000 and other glass cockpit like the Avidyne Entegra and Perspective are the best learning environments, since pilots are learning both glass and traditional round gauges at the same time. It’s important for instructors in these planes to sometimes dim the displays and force student pilots to learn to fly and land the airplane using the round backup gauges. Every student pilot I’ve taught in a glass cockpit had no trouble landing the first time using just the round backup gauges. I’m also teaching pilots the fundamentals of the autopilot by the 3rd or 4th lesson. The autopilot greatly assists pilots with managing cockpit workload and ultimately frees up their mind so that they can make better decisions. It’s important that pilots learn that early in their career and not just think of the autopilot as something only airline pilots use. 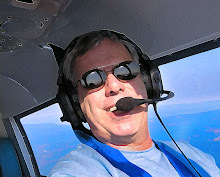 World of Flying: Tell my readers a couple of hairy flight instructor stories. Have you ever had the crap scared out of you? Max Trescott: I always tell pilots that the most important thing about learning to fly is to never scare their flight instructor . I’m kidding of course, but the reality is that I’m hard pressed to remember being scared by a client. I do remember being fairly relaxed one time while flying in a high performance plane with a licensed pilot. That changed very quickly when I heard the stall horn go off while we were still on a 1-mile final. Funny how just when you think you’re with an experienced pilot and can relax, something like that happens to remind you that flying is very unforgiving—especially if you don’t have enough airspeed! 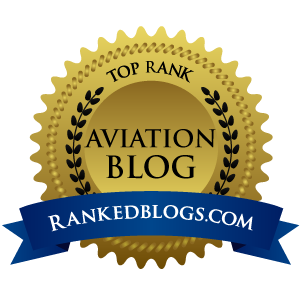 World of Flying: Do you see a difference in flight instructors between the ones like yourself who are full-time teachers and those who are just earning time to get to the airlines? Max Trescott: There are excellent CFIs in both of those categories. Of course you’ll always find a few instructors who either don’t have their heart in teaching or are unfamiliar with some of the aircraft in which teach. Frankly, I see very few of those CFIs in my area. But I hear frequent complaints from glass cockpit aircraft owners who travel some distance to fly with me because they have flown with CFIs who said they knew the equipment, but knew less than the owner. I’m a strong proponent of CFIs specializing in a few areas rather than trying to be a jack-of-all-trades. I often refer pilots to other CFIs who specialize in areas in which I am qualified to teach (e.g. tailwheel) but in which I’ve chosen not to specialize.